Merci chocolates are the finest assortment of European Chocolates that will just melt in your mouth. If you are a chocolate lover this little gourmet candy bars are for you. You get 7 different flavors of Merci’s per box. 1. Milk Chocolate – Solid Milk chocolate at its smooth, creamy European best. 2. Coffee and Cream – Rich coffee flavored dark chocolate atop a white chocolate base. 3. Hazelnut-Almond – Delicious pieces of hazelnuts and almonds in a smooth milk chocolate. 4. Hazelnut-Crème - Milk chocolate filled with a smooth, creamy hazelnut crème. 5. Dark Cream- Smooth, rich melt in your mouth dark chocolate. 6. Dark Mousse - Fluffy chocolate mousse wrapped in dark chocolate. 7. Praline-Crème – Luscious Milk Chocolate with a smooth chocolate praline center. I don’t know about you, but my mouth is watering. 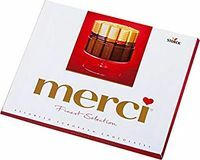 These Merci chocolates make great Christmas presents birthday gifts or just to have in a candy dish. 15 Individually wrapped candies per box.